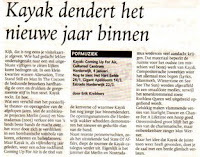 On friday, 4 january 2008, it was time for the first of many "Coming Up For Air"-concerts. It was also the first day that -at the venue- the new album was for sale, so nobody really knew what to expect. Kayak immediately tried to 'rock our socks off', with 3 new songs in the first 20 minutes. It is still very hard to judge the material (at the time of writing, I still have not heard the album completely...), but the new stuff seemed to have quite a heavy basis. And that would mean that Kayak has not chosen to copy anything they did in the past. Some of the new songs -at first impression- could almost be compared to bands like Arena or the Dutch gothrockers Within Temptation. And Cindy's voice really suited this kind of music! Edward, as usual, was the master of the softer songs. I was not too impressed by the sound and the stage presentation in the first half. It was a typical "premiere", and everybody just tried to play as faultless as possible. Indeed, not many mistakes were made, but the whole thing looked and sounded a little 'stiff'. But I guess that's nothing more than logic. From the new album, I think 9 songs were played. The 'oldies' in the show were not very surprising: Ruthless Queen, Starlight Dancer, Only You And I Know, some songs from Merlin and Nostradamus, and a medley of the very early singles. But it was certainly good to hear 'first-timers' like Sad To Say Farewell and Where Do We Go From Here.